A whole bunch of us bloggers in Southern California decided to get together and not only hike together (as we had done previously) but also camp out afterward. Perhaps one of the first Tweetouts? I say yes! But the views weren't the only thing discussed, we had lots to catch up on about the world of blogging and tweeting and there is always a lot of "shop talk" when we get together. 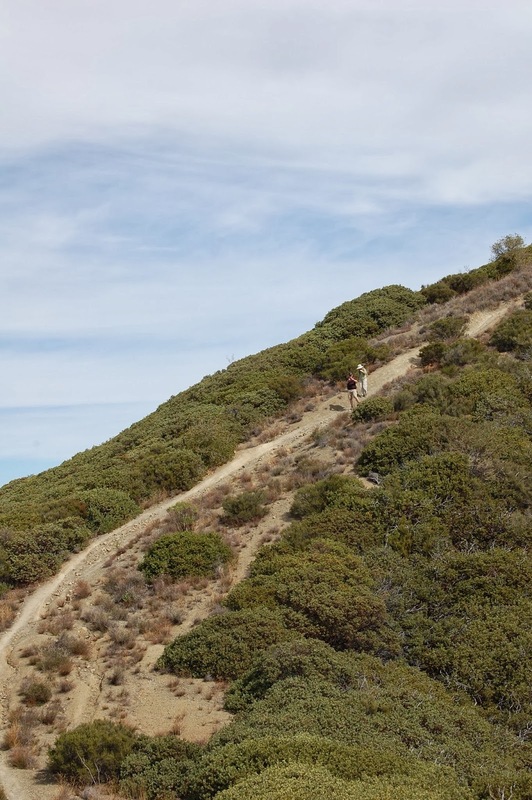 Its about 700-800 feet on the ol fire road till you hit the junction with the Trabuco Canyon Trail and Los Pinos Mountain comes into view. HOWEVER, there definitely are some quad burning sections as you make your way to the summit and what is always depressing is that to go to the summit you actually go down a few ridge lines to get to the summit so you know you will going UP them later. Finally we gained the summit and met that magical panda who resides in the summit register. but if you don't also put a place in your heart for a little panda then I don't know what to say. 2 summits in one day, beautiful views, pandas and catching up with SoCal bloggers? Sounds like a great day to me! What hijinks did we get up to in camp? Stay tuned for part II coming out soon! Nice write up Pete, can't wait for round 2! Some great pictures as well and I am excited that the USGS is recognizing what we named the second mountain! The government bends to my will, what can I say? Great hiking with you all (again). When's the next one! ?